October 23, 2017 by Ecommerce News. About Logistics with tags Europe. 6507 views. 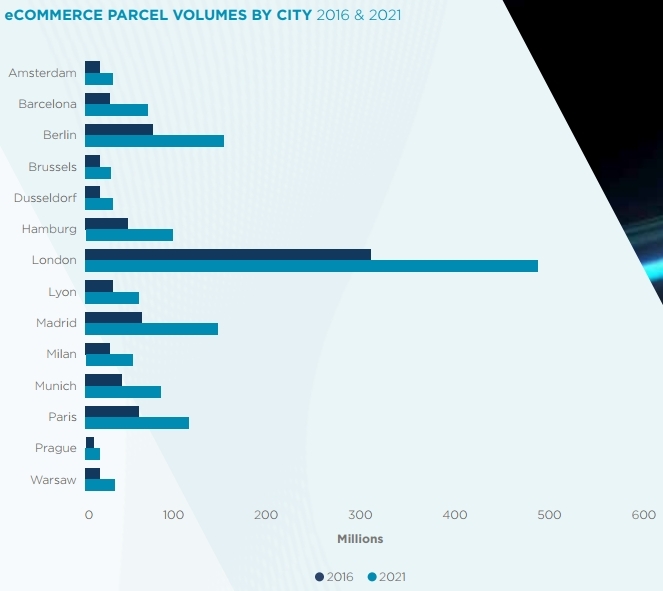 The demand for urban logistics space throughout Europe is growing, as there is an increasing number of ecommerce orders. It’s forecasted the parcel volume in Europe will be increased with 69 percent by 2021. And online retailers want to please customers with last mile deliveries, so more warehouses in and around cities are needed. According to the Urban Logistics report by Cushman & Wakefield, available sites for urban logistics use (‘last mile delivery’) are in short supply in most of the cities in Europe. And the cost of urban deliveries is high, up to 50 percent or more of total supply chain costs in Europe. Cushman & Wakefield writes that the cost of last mile delivery is expected to grow between 7 and 10 percent of the next five years in mature markets such as the UK and Western Europe. “For the moment, real estate solutions are situated on the outskirts and at best, on the rims of cities, unable to enter cities due to competing higher value land uses and city stakeholders’ opposition to logistics”, the researchers write. They say more urban logistics space is really needed in Europe. Three quarters of Europe’s population currently lives in urban areas, while online sales in Europe are expected to rise by 94 percent by 2021. As a result, a 69 percent increase in parcel deliveries is expected by 2021. Cushman & Wakefield makes use of a ‘Urban Space Model’, which quantifies the total space requirements in Europe’s leading ecommerce markets. London, the largest and most mature ecommerce market in Europe, stands out with a total requirement of almost 870,000 m². But due to Brexit and the market maturity, the required space in London will increase with the slowest pace in Europe during the next five years. But in Madrid and Barcelona for example, the required square meters will more than double over the next four years.